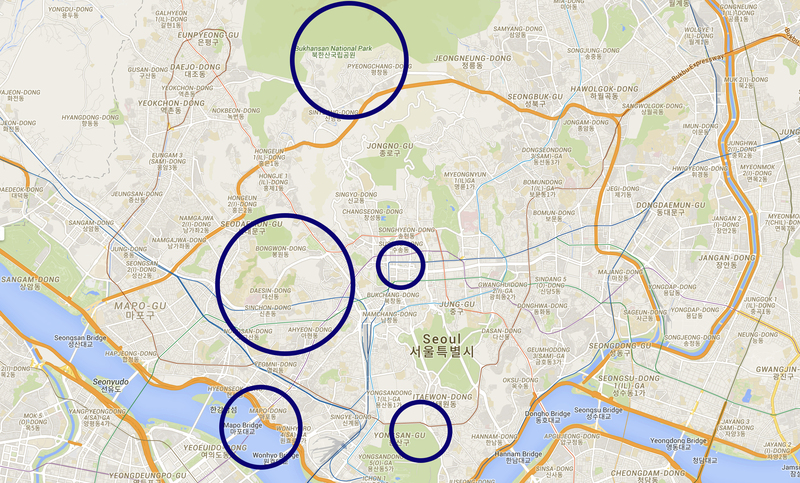 While leaflets likely sent by balloon from North Korea have been showing up in Seoul for decades, NK News has been covering their arrival more frequently than other media in South Korea over the past two years. On the one hand this is because NK News staff and sources have been finding them around town with increasing frequency since late 2016, and on the other because South Korea’s National Security Law means local media seldom report on the details of leaflets found here. But while it’s hard to know whether or not North Korea is sending more leaflets than in prior years, since January 2018 – when Kim Jong Un gave his New Year’s Speech calling for inter-Korean cooperation – the tone of these fliers found changed dramatically. 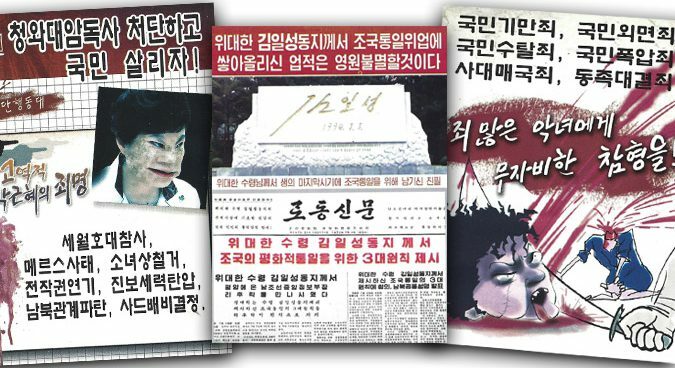 Given that the last two South Korean administrations were conservative in nature and mostly opposed to inter-Korean economic cooperation, it’s perhaps no surprise that the leaflets sent by the North prior to this change were either antagonistic in nature or designed to showcase the benefits of North Korean ideology. 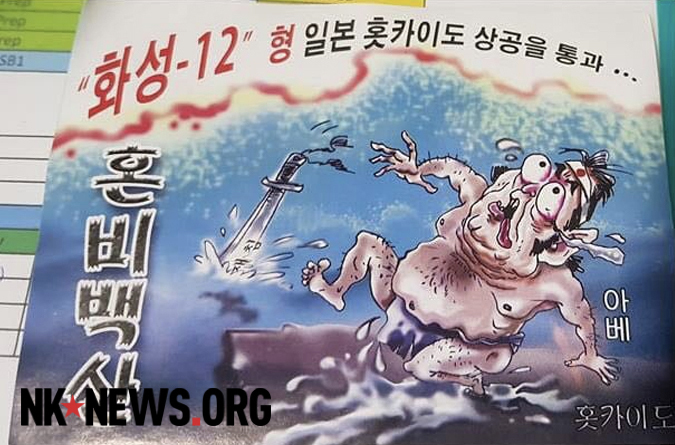 Throughout the final period of Park Geun-hye administration, for example, crude cartoons found on North Korean leaflets found in Seoul often depicted the South Korean leader as worthy of death. 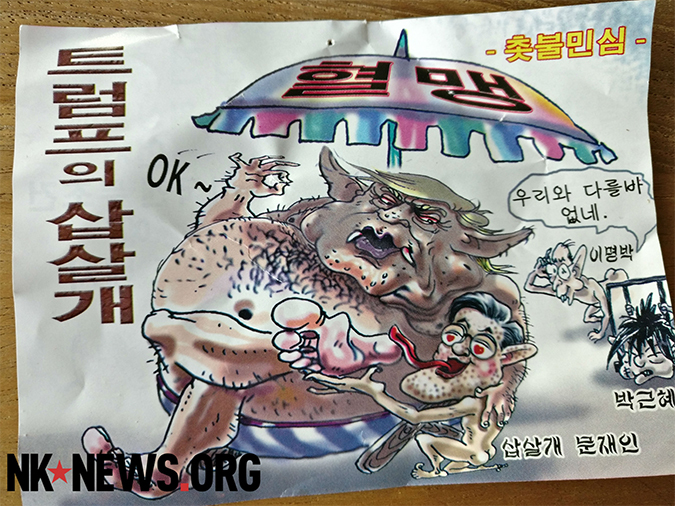 Similar cartoons in late 2016 complained about the Obama administration’s support for the deployment of a U.S. anti-missile system to South Korea, as well as in 2017 targeting figures like Japanese Prime Minister Shinzo Abe for Tokyo’s stance on the controversial ‘comfort woman’ issue, as well as calling for the death of current U.S. President Trump. 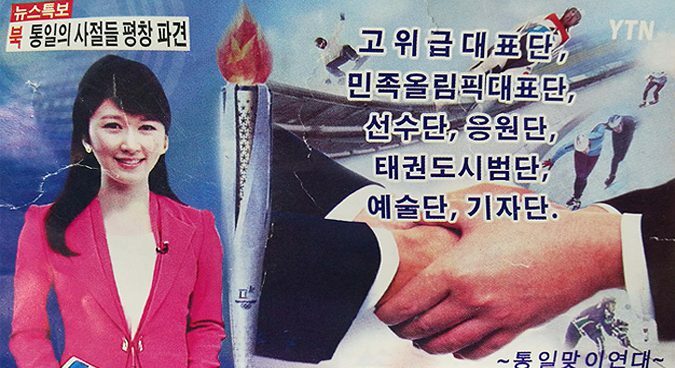 But besides a steady flow of insults, another common theme in leaflet drops over Seoul has been to promote North Korean ideology through the celebration of the nation’s political system, anniversaries, and emerging weapons systems. 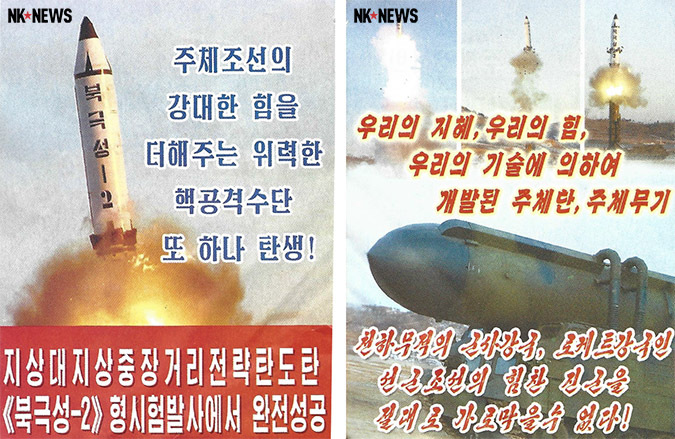 As a result, in 2017 these designs promoted issues like North Korea’s Pukguksong-2 solid-fueled ballistic missile capabilities, success stories about South Koreans who – decades ago – defected to the DPRK, and celebrations of anniversaries, like the birth of former leaders Kim Il Sung and Kim Jong Il. And while North Korean leaflets arriving in South Korea took a pause following Moon’s election – likely because of a change in the direction of prevailing winds during the summer months – it wasn’t long before they returned in October, taking renewed aim at President Trump and other key officials in the new South Korean administration. And so things continued this way until late December. 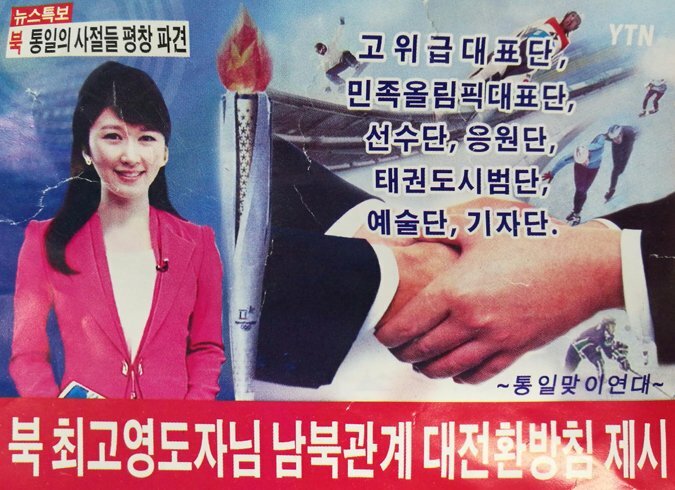 For example, in January leaflets suddenly begun promoting inter-Korean economic cooperation, previous joint inter-Korean declarations, as well as encouraging anti-war sentiment. Others have promoted famous symbols of inter-Korean economic cooperation, like the now-shuttered Kaesong industrial complex and the Mt. Kumgang tour zone. 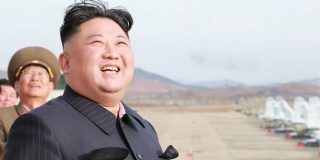 Some found in February have even directly referenced January’s inter-Korean talks and highlighting the “great door of unification”. In addition, the style used for many has changed, no longer featuring crude and antagonistic cartoons. 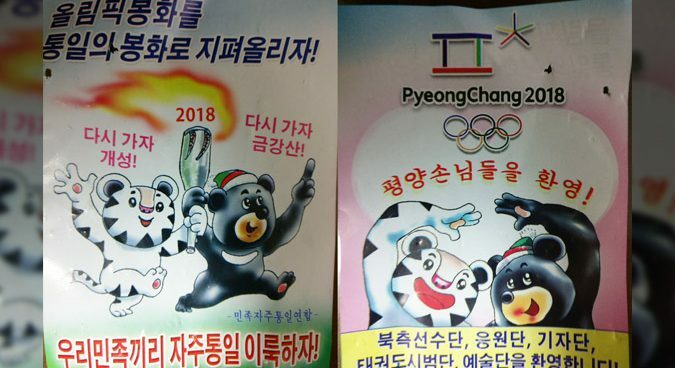 Instead, happy photos of North and South Korean civilians mingling together, stills from South Korean TV news, as well as more locally recognizable cartoon depictions such as of the Pyeongchang Olympics mascots have been showing up with increasing frequency. It’s all a far cry from what was arriving over the last two years. Which begs the question: what’s behind the change in tone? 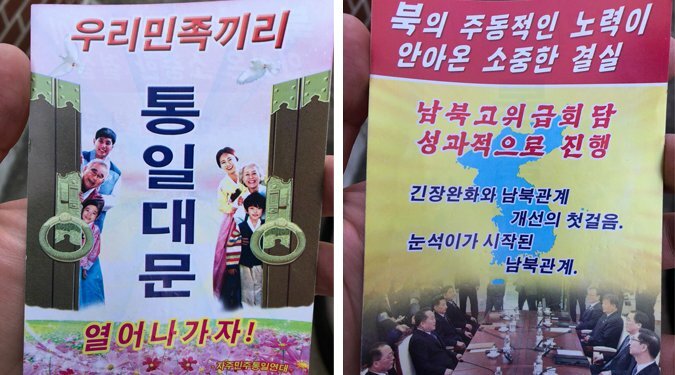 Just how effective are these leaflets really in shifting South Korean public opinion? And how do they even show up in South Korea in the first place? North Korean propaganda leaflets and fliers coming to South Korea are thought to be sent by balloon from locations not far from the demilitarized zone that separates the two countries. Dispatched from locations in the extreme southwest of North Korea, prevailing winds between fall and early spring appear to carry these balloons at high altitude to airspace above central Seoul, where they pop and distribute their cargoes over populated areas. But NK News staff, this correspondent included, have been surprised to find leaflets regularly showing up in the same parts of Seoul. Furthermore, they are almost never found accompanied by evidence of burst balloons, leading some to ponder whether undercover operatives sympathetic to the North are actually physically distributing the leaflets on behalf of the DPRK. 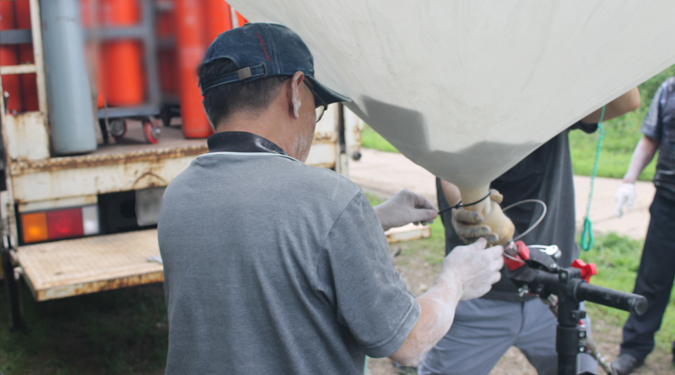 But specialists familiar with balloon launches like Pastor Eric Foley, whose Seoul-based NGO Voice of the Martyrs regularly sends balloons northwards, says the reoccurring locations and lack of accompanying balloons may support the idea they are dropped from the skies. Furthermore, the anonymous source said the locations leaflets are sometimes found don’t support the idea that people are placing them there manually. And the lack of evidence of popped balloons? 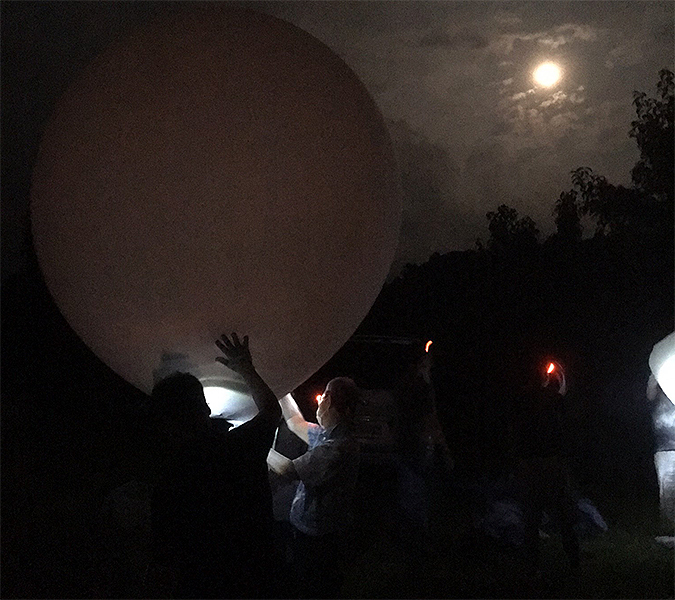 “The more sophisticated balloons used by groups like Voice of the Martyrs Korea pop high in the atmosphere and leave no trace,” Foley says, adding that his group’s research suggests North Korean agents use the same type to send their leaflets South. 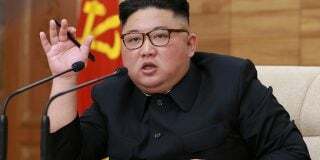 Analysts said the abrupt change in tone makes sense: it was North Korea’s Supreme Leader, after all, who personally declared on January 1 that Pyongyang is now interested in improving relations with the South. 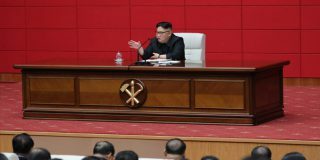 “What Kim Jong Un said marked a 180-degree turnaround in North Korea’s policy towards the South,” said Go Myong-Hyun, a research fellow at the Asan Institute for Policy Studies. “Not unlike in Orwell’s 1984, North Korea is a society that can turn on a dime (and) the propaganda leaflet is an element in a larger “peace offensive” campaign,” he said. 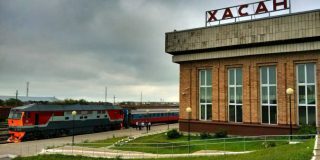 Consequently, the change in tone had been “dramatic,” representing a new line of propaganda “not been seen for the last ten years,” said the anonymous source who found many of the leaflets in 2018. “Together with the representation of North Korea at the Olympics I would say (the new style) shows a seriousness to come back to business with South Korea, (but) not yet the USA,” the anonymous source said. 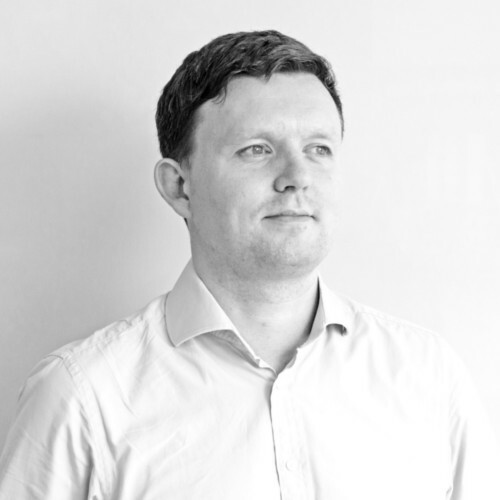 But the rapid change raises questions about how the North is able to produce new content. 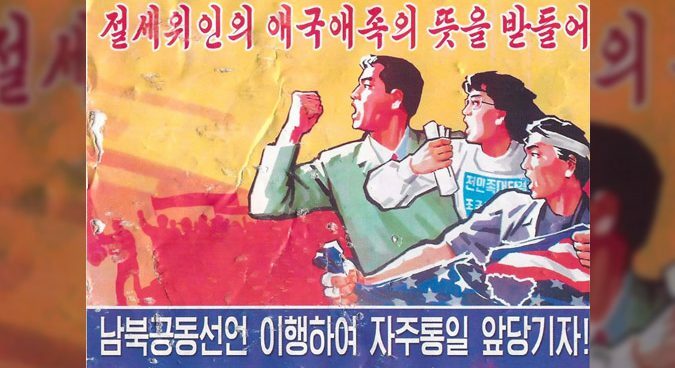 “We know so little about the process of manufacture and distribution of these leaflets,” said Jacco Zwetsloot, who has long studied North Korean leaflets from Seoul. But because senders in the North are appearing quick to respond to changes in the news cycle, it suggests belief there exists that leaflets dropped by balloon are effective to warrant regular investment in the practice. 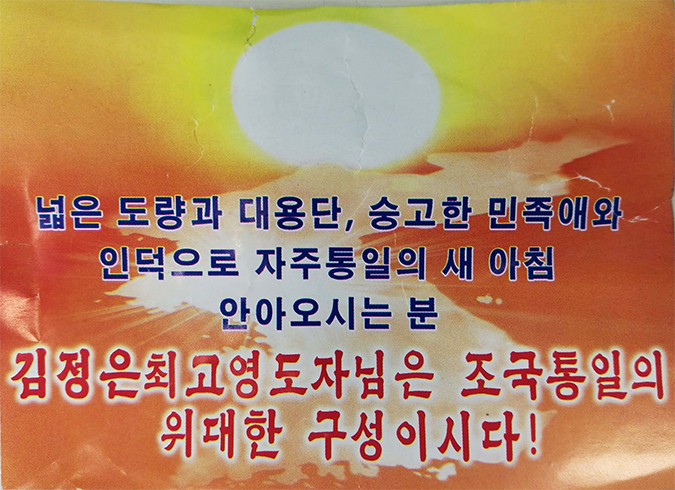 How effective, then, are North Korean leaflets in convincing Seoulites about the virtues of Kim Jong Un’s Korea? “How often do you get handed a leaflet on the street and find it changes your opinion?” asked Andray Abrahamian, a research fellow at the CSIS Pacific Forum in Hawaii. But not all agree, particularly with the emerging line visible in some recent flyers. And another effect on not those who necessarily find the leaflets, but those who hear about them arriving in the South. Subscribe to read the remaining 2022 words of this article.